Value of the function at the node. 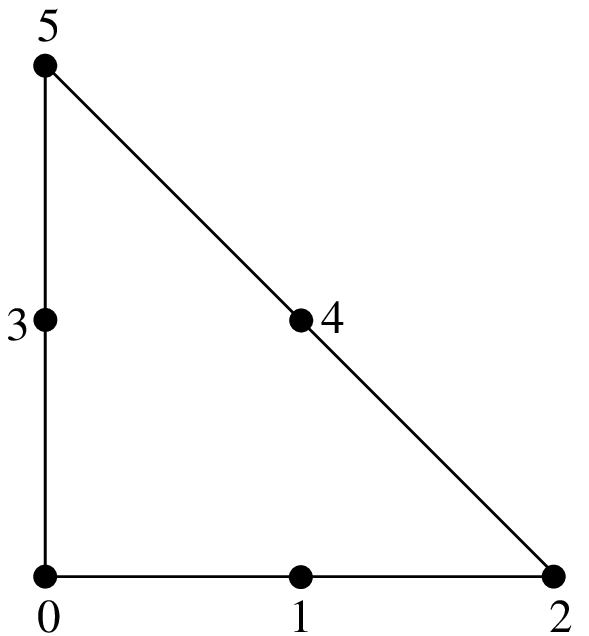 Value of the gradient along of the first coordinate. 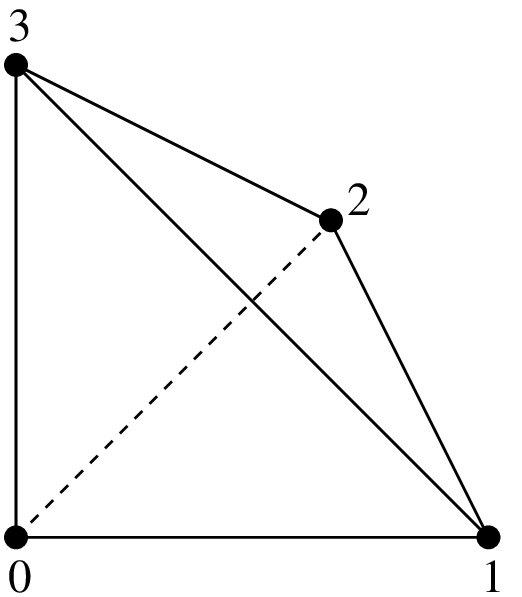 Value of the gradient along of the second coordinate. Value of the gradient along of the third coordinate for 3D elements. Value of the whole gradient at the node. Value of the normal derivative to a face. Value of the second derivative along the first coordinate (twice). Value of the second derivative along the second coordinate (twice). Value of the second cross derivative in 2D or second derivative along the third coordinate (twice) in 3D. 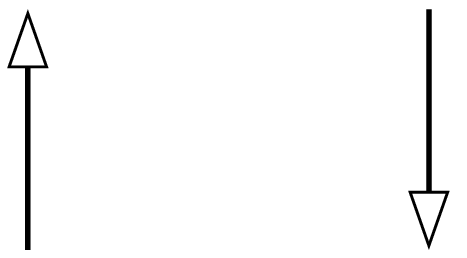 Value of the whole second derivative (hessian) at the node. 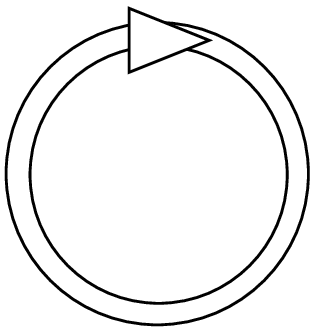 Scalar product with a certain vector (for instance an edge) for a vector elements. 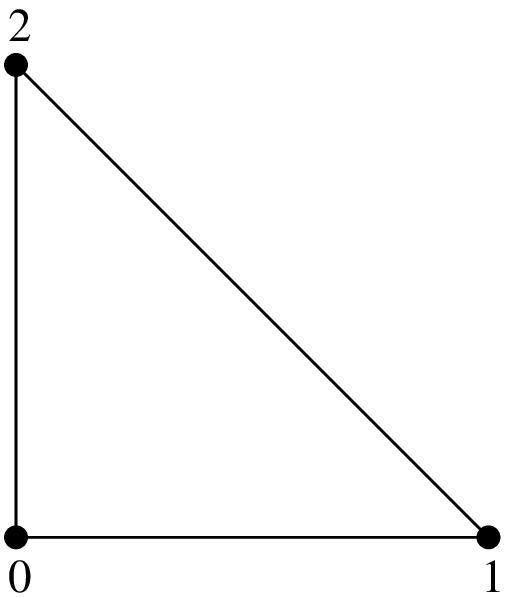 Scalar product with the normal to a face for a vector elements. 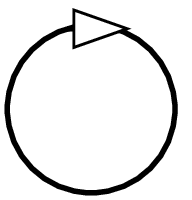 Bubble function on an element or a face, to be specified. Lagrange hierarchical d.o.f. value at the node in a space of details. where "name of method" is a string to be choosen among the existing methods. It is possible to define a classical Lagrange element of arbitrary dimension and arbitrary degree. 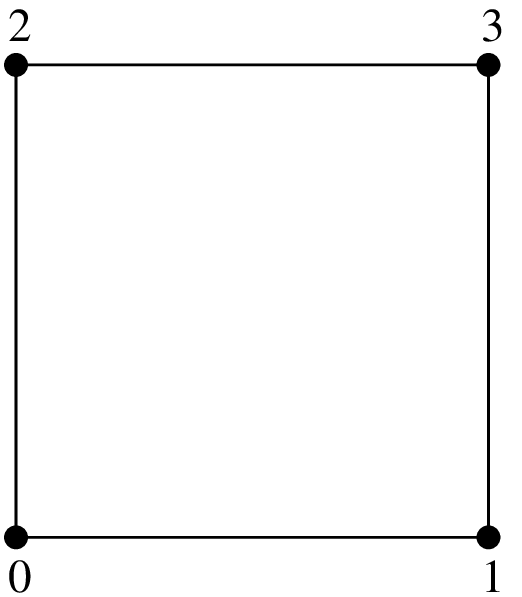 Each degree of freedom of such an element corresponds to the value of the function on a corresponding node. 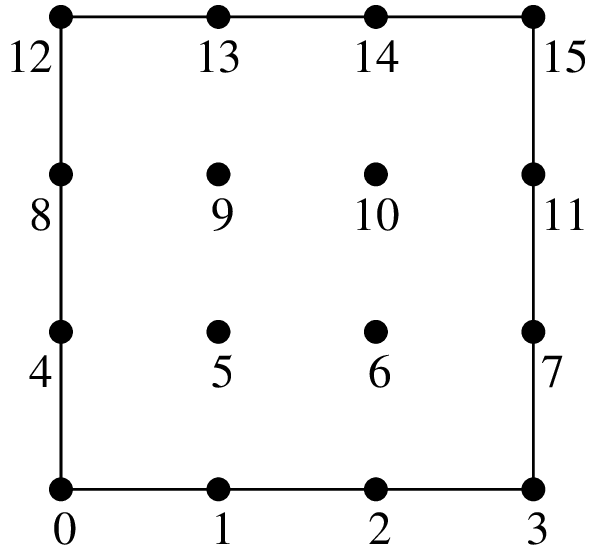 The grid of node is the so-called Lagrange grid. 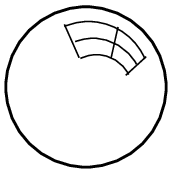 Figures Examples of classical Lagrange elements on a segment. 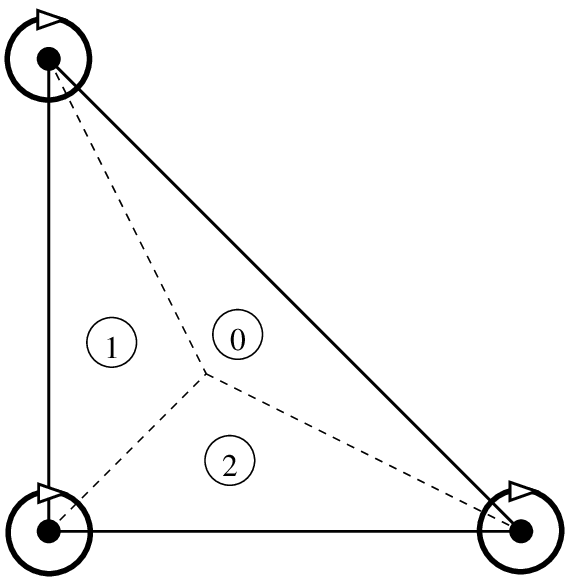 Examples of classical Lagrange elements on a triangle. The number of degrees of freedom for a classical Lagrange element of dimension and degree is . For instance, in dimension 2 , this value is and in dimension 3 , it is . 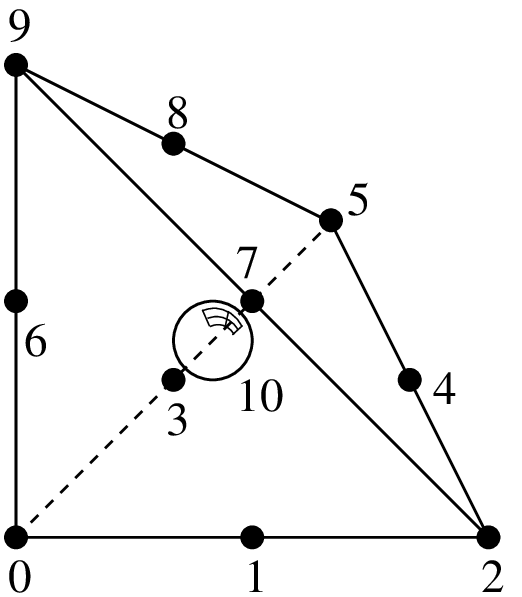 Examples of classical Lagrange elements on a tetrahedron. When between two elements of the same degrees (even with different dimensions), the d.o.f. of a common face are linked, the element is of class . This means that the global polynomial is continuous. If you try to link elements of different degrees, you will get some trouble with the unlinked d.o.f. This is not automatically supported by GetFEM++, so you will have to support it (add constraints on these d.o.f.). For some applications (computation of a gradient for instance) one may not want the d.o.f. of a common face to be linked. This is why there are two versions of the classical Lagrange element. Classical Lagrange element "FEM_PK(P, K)"
Discontinuous Lagrange element "FEM_PK_DISCONTINUOUS(P, K)"
Even though Lagrange elements are defined for arbitrary degrees, to choose a high degree can be problematic for a large number of applications due to the “noisy” characteristic of the lagrange basis. These elements are recommended for the basic interpolation but for p.d.e. applications elements with hierarchical basis are preferable (see the corresponding section). where and are respectively the base functions of the first and second element. Examples of classical Lagrange elements in dimension 2. The element on a parallelepiped of dimension is obtained as the tensorial product of classical elements on the segment. 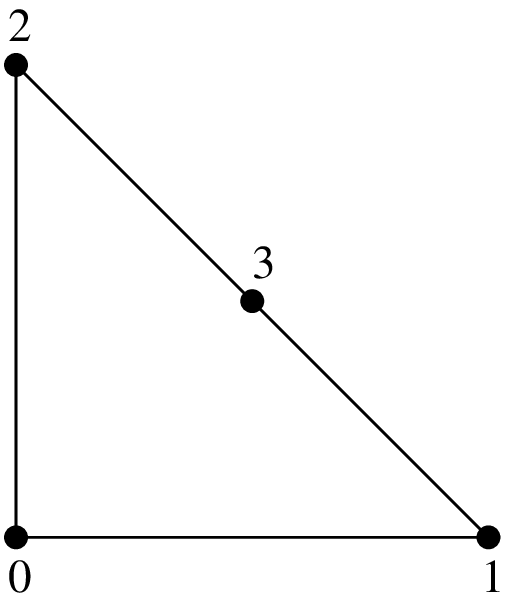 Examples in dimension 2 are shown in figure dimension 2 and in dimension 3 in figure dimension 3. 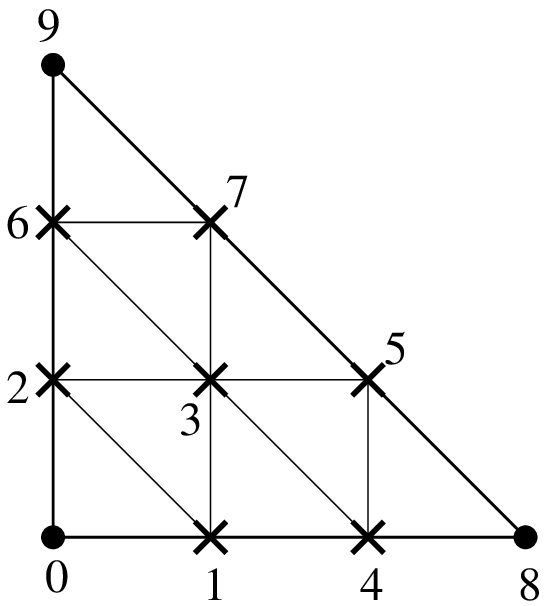 A prism in dimension is the direct product of a simplex of dimension with a segment. 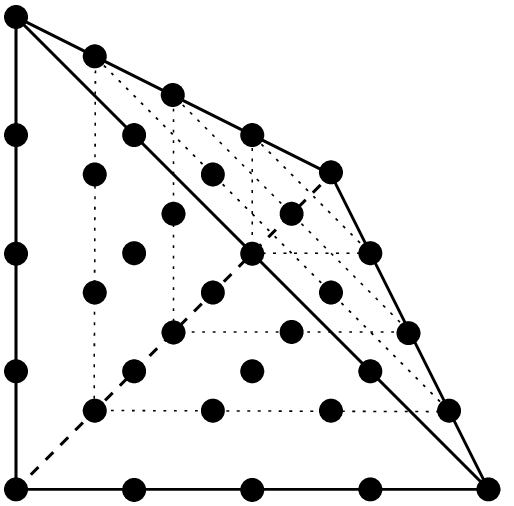 The element on this prism is the tensorial product of the classical element on a simplex of dimension with the classical element on a segment. 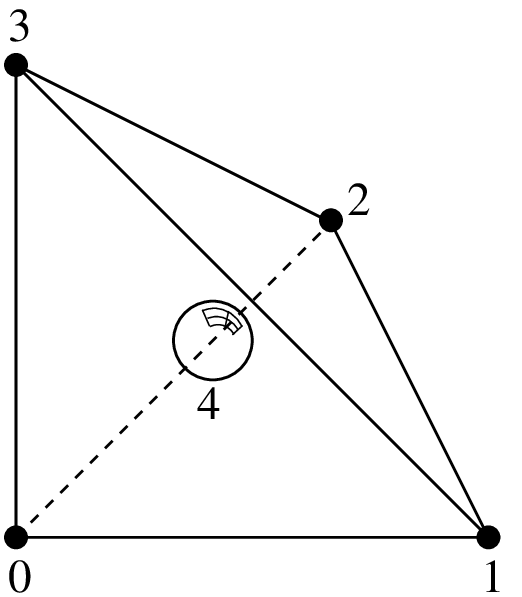 For this coincide with a parallelepiped. Examples in dimension are shown in figure dimension 3. This is also possible not to have the same degree on each dimension. 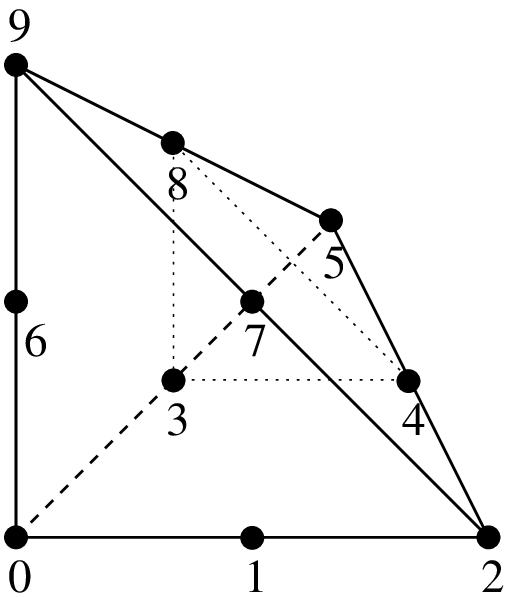 An example is shown on figure dimension 3, prism. Examples of classical Lagrange elements in dimension 3.
. Lagrange element on parallelepipeds "FEM_QK(P, K)"
. Lagrange element on prisms "FEM_PK_PRISM(P, K)"
. 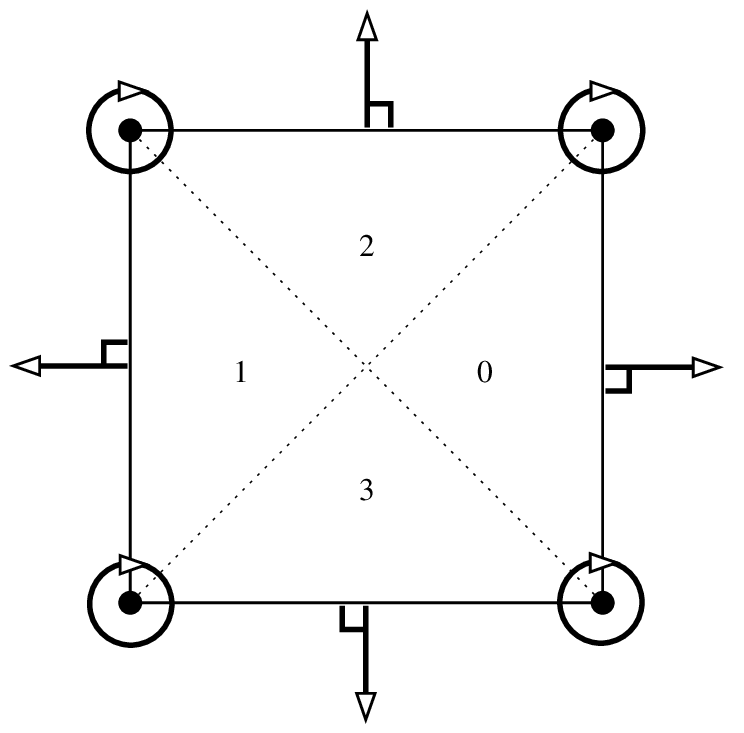 Lagrange element on prisms "FEM_PRODUCT(FEM_PK(P-1, K1), FEM_PK(1, K2))"
Incomplete Lagrange element on parallelepipeds (Quad 8 and Hexa 20 serendipity elements) "FEM_Q2_INCOMPLETE(P)"
The idea behind hierarchical basis is the description of the solution at different level: a rough level, a more refined level ... In the same discretization some degrees of freedom represent the rough description, some other the more rafined and so on. This corresponds to imbricated spaces of discretization. 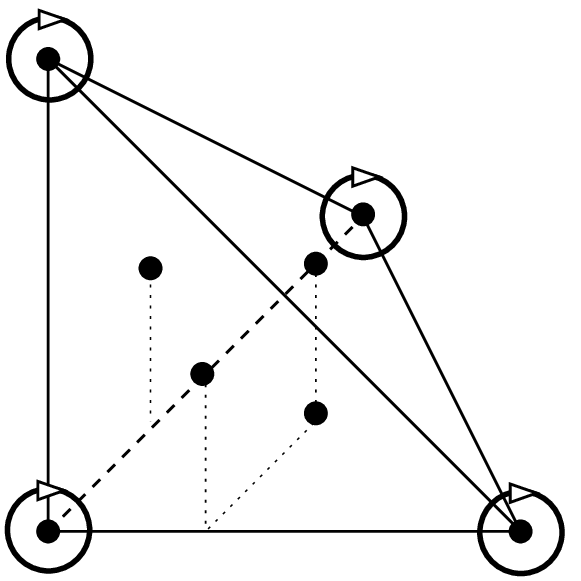 The hierarchical basis contains a basis of each of these spaces (this is not the case in classical Lagrange elements when the mesh is refined). Among the advantages, the condition number of rigidity matrices can be greatly improved, it allows local raffinement and a resolution with a multigrid approach.
. Classical Lagrange element on simplices but with a hierarchical basis with respect to the degree "FEM_PK_HIERARCHICAL(P,K)"
. Classical Lagrange element on parallelepipeds but with a hierarchical basis with respect to the degree "FEM_QK_HIERARCHICAL(P,K)"
. 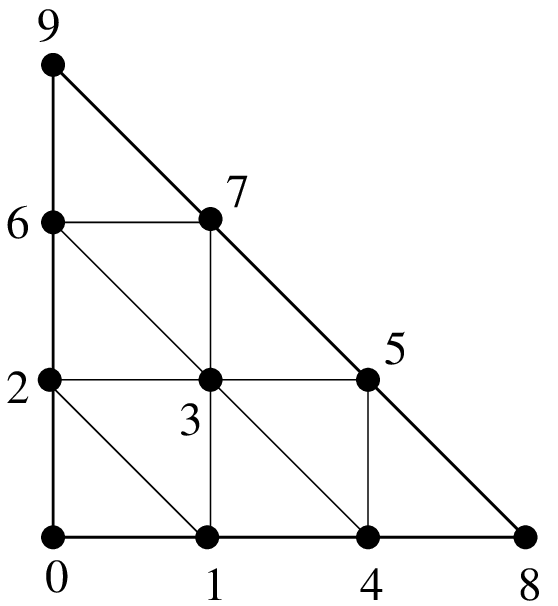 Classical Lagrange element on prisms but with a hierarchical basis with respect to the degree "FEM_PK_PRISM_HIERARCHICAL(P,K)"
some particular choices: will be built with the basis of the , the additional basis of the then the additional basis of the . The principal interest of the composite elements is to build hierarchical elements. But this tool can also be used to build piecewise polynomial elements. Composition of a finite element method on an element with S subdivisions "FEM_STRUCTURED_COMPOSITE(FEM1, S)"
It is important to use a corresponding composite integration method. Hierarchical composition of a finite element method on a simplex with S subdivisions "FEM_PK_HIERARCHICAL_COMPOSITE(P,K,S)"
Hierarchical composition of a hierarchical finite element method on a simplex with S subdivisions "FEM_PK_FULL_HIERARCHICAL_COMPOSITE(P,K,S)"
Other constructions are possible thanks to "FEM_GEN_HIERARCHICAL(FEM1, FEM2)" and "FEM_STRUCTURED_COMPOSITE(FEM1, S)". Raviart-Thomas of lowest order element on simplices "FEM_RT0(P)"
Raviart-Thomas of lowest order element on parallelepipeds (quadrilaterals, hexahedrals) "FEM_RT0Q(P)"
The 1D GaussLobatto element is similar to the classical fem on the segment, but the nodes are given by the Gauss-Lobatto-Legendre quadrature rule of order . 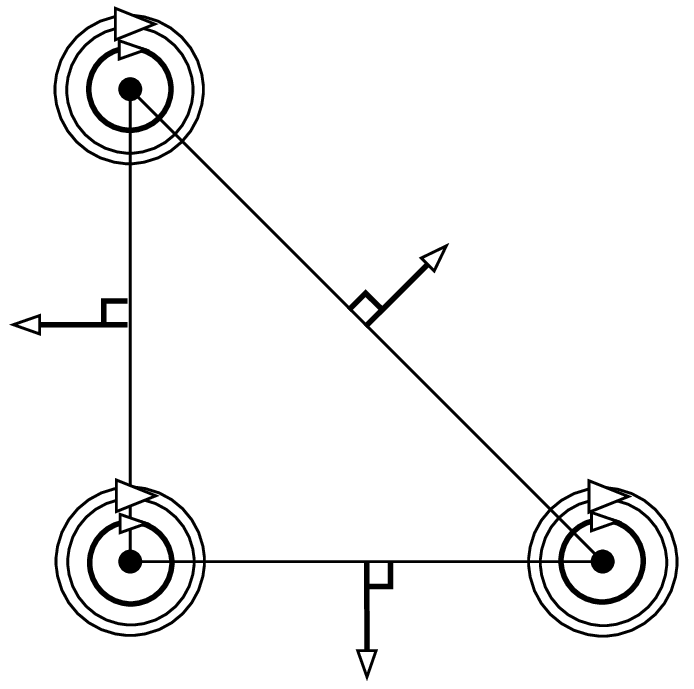 This FEM is known to lead to better conditioned linear systems, and can be used with the corresponding quadrature to perform mass-lumping (on segments or parallelepipeds). 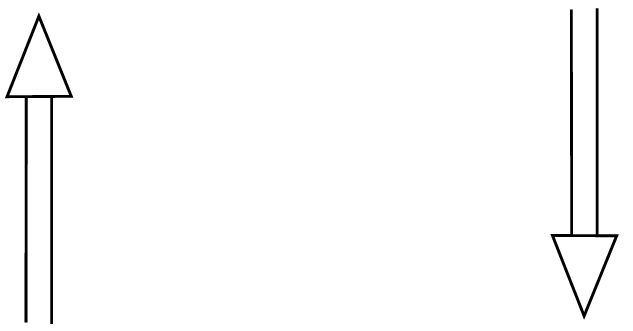 The polynomials coefficients have been pre-computed with Maple (they require the inversion of an ill-conditioned system), hence they are only available for the following values of : . Note that for and , this is the classical and fem. GaussLobatto element on the segment "FEM_PK_GAUSSLOBATTO1D(K)"
This element is close to be -equivalent but it is not. On the real element the value of the gradient on vertices will be multiplied by the gradient of the geometric transformation. The matrix is not equal to identity but is still diagonal. Hermite element on the segment "FEM_HERMITE(1)"
Lagrange element with an additional internal bubble function "FEM_PK_WITH_CUBIC_BUBBLE(1, 1)"
Lagrange or element with an additional internal bubble function "FEM_PK_WITH_CUBIC_BUBBLE(2, K)"
Lagrange with an additional internal piecewise linear bubble function "FEM_P1_PIECEWISE_LINEAR_BUBBLE"
Lagrange element with an additional bubble function on face 0 "FEM_P1_BUBBLE_FACE(2)"
. 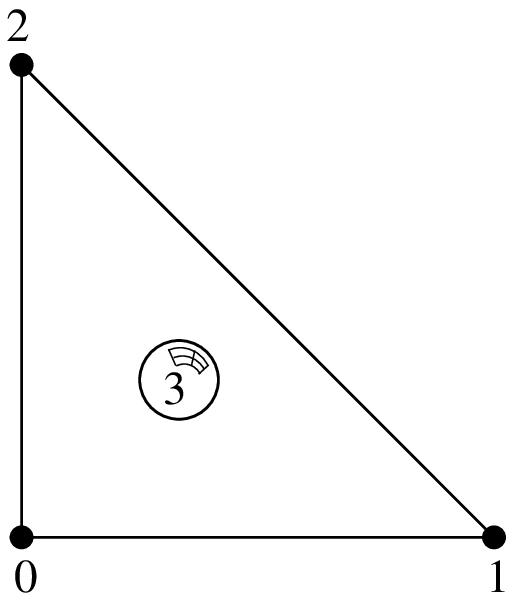 Lagrange element on a triangle with additional d.o.f on face 0 "FEM_P1_BUBBLE_FACE_LAG"
. 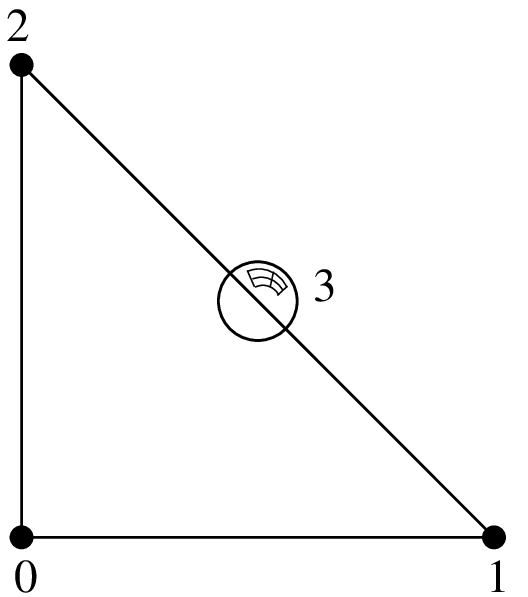 non-conforming element on a triangle "FEM_P1_NONCONFORMING"
This element is not -equivalent (The matrix is not equal to identity). On the real element linear combinations of and are used to match the gradient on the corresponding vertex. 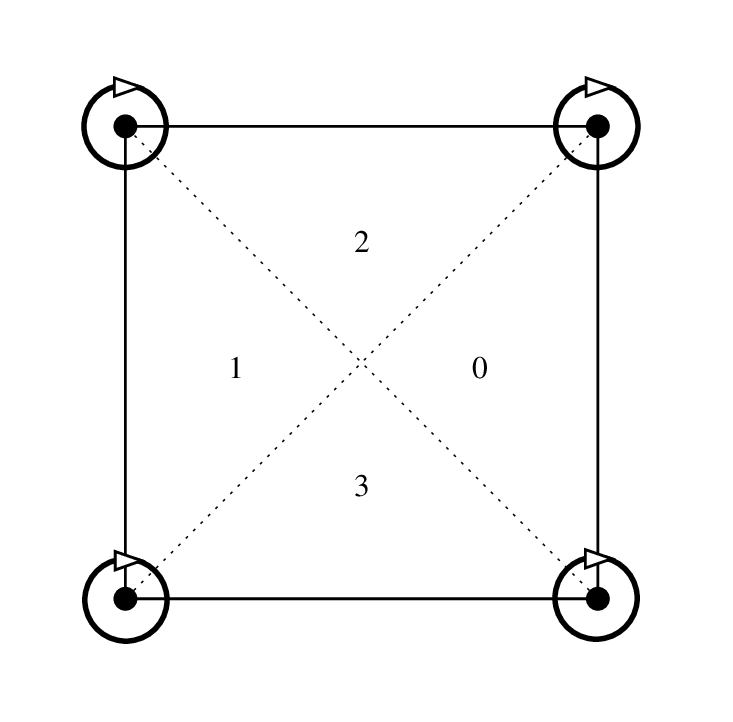 Idem for the two couples , and , for the two other vertices. Hermite element on a triangle "FEM_HERMITE(2)"
This element is not -equivalent (The matrix is not equal to identity). In particular, it can be used for non-conforming discretization of fourth order problems, despite the fact that it is not . 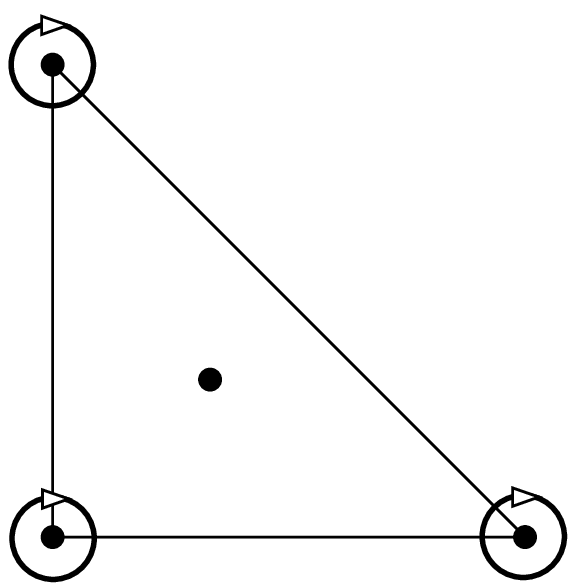 Morley element on a triangle "FEM_MORLEY"
This element is not -equivalent (The matrix is not equal to identity). On the real element linear combinations of the transformed base functions are used to match the gradient, the second derivatives and the normal derivatives on the faces. Note that the use of the matrix allows to define Argyris element even with nonlinear geometric transformations (for instance to treat curved boundaries). 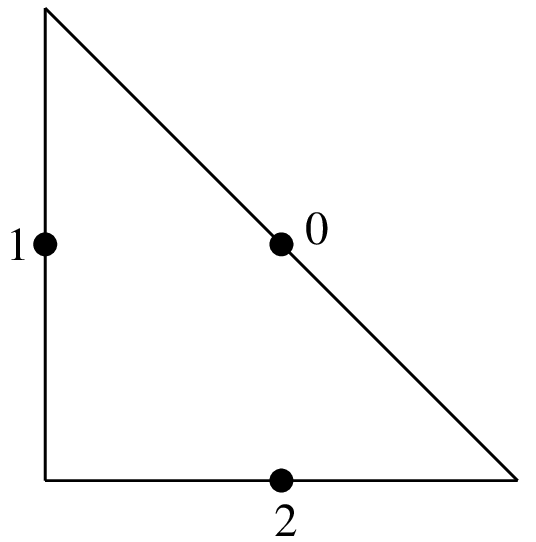 Argyris element on a triangle "FEM_ARGYRIS"
This element is not -equivalent. This is a composite element. 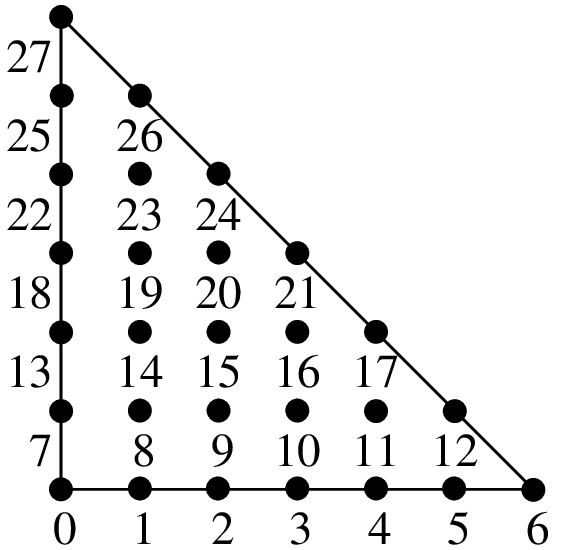 Polynomial of degree 3 on each of the three sub-triangles (see figure Hsieh-Clough-Tocher (HCT) element, , 12 d.o.f., and [ciarlet1978]). It is strongly advised to use a "IM_HCT_COMPOSITE" integration method with this finite element. The numeration of the dof is the following: 0, 3 and 6 for the lagrange dof on the first second and third vertex respectively; 1, 4, 7 for the derivative with respects to the first variable; 2, 5, 8 for the derivative with respects to the second variable and 9, 10, 11 for the normal derivatives on face 0, 1, 2 respectively. 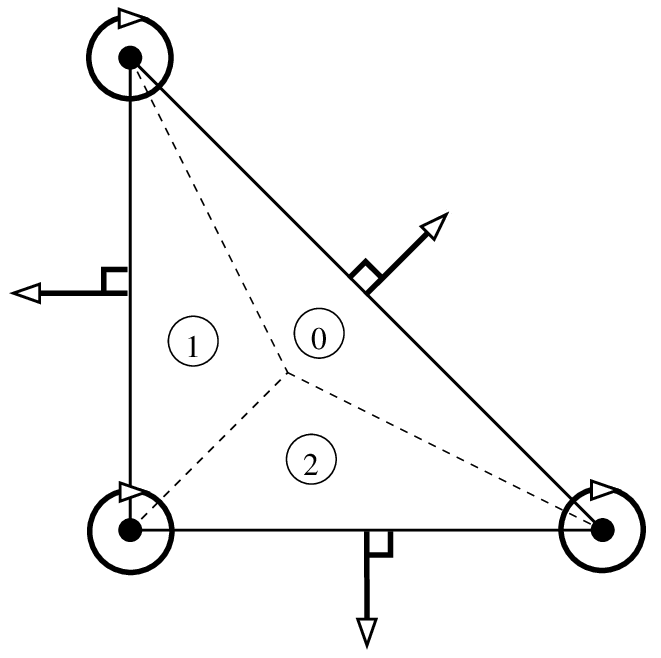 HCT element on a triangle "FEM_HCT_TRIANGLE"
Reduced HCT element on a triangle "FEM_REDUCED_HCT_TRIANGLE"
This element is not -equivalent. This is a composite element. 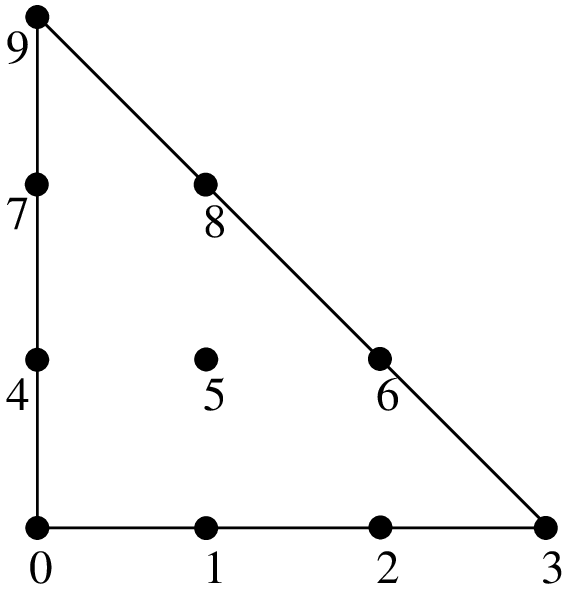 Polynomial of degree 3 on each of the four sub-triangles (see figure Composite element on quadrilaterals, piecewise , 16 d.o.f., ). At least on the reference element it corresponds to the Fraeijs de Veubeke-Sander element (see [ciarlet1978]). It is strongly advised to use a "IM_QUADC1_COMPOSITE" integration method with this finite element.
. composite element on a quadrilateral (FVS) "FEM_QUADC1_COMPOSITE"
Reduced composite element on a quadrilateral (reduced FVS) "FEM_REDUCED_QUADC1_COMPOSITE"
GetFEM++ proposes some Lagrange pyramidal elements of degree 0, 1 and two based on [GR-GH1999] and [BE-CO-DU2010]. See these references for more details. 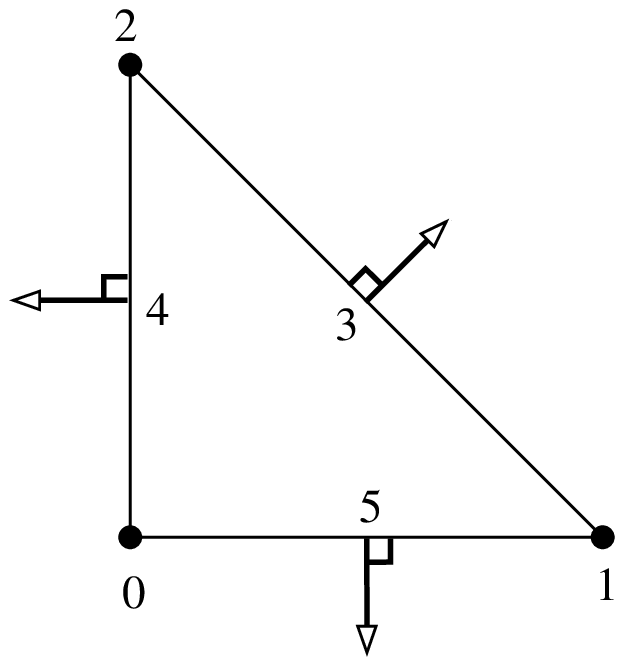 The proposed element can be raccorded to standard or Lagrange fem on the triangular faces and to a standard or Lagrange fem on the quatrilateral face. 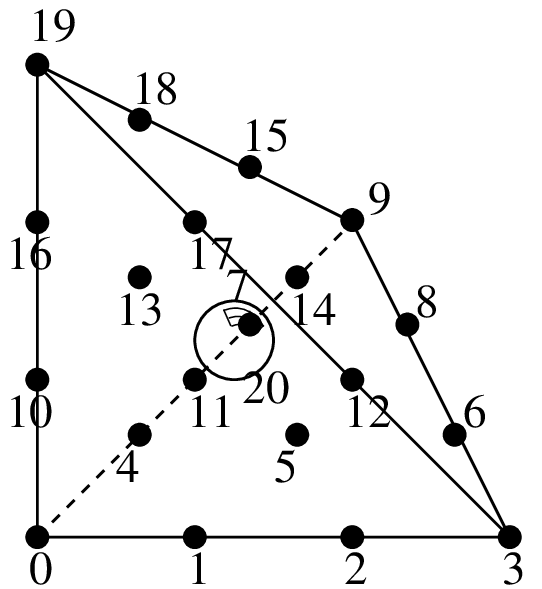 Continuous Lagrange element of order 0, 1 or 2 "FEM_PYRAMID_LAGRANGE(K)"
Discontinuous Lagrange element of order 0, 1 or 2 "FEM_PYRAMID_DISCONTINUOUS_LAGRANGE(K)"
Lagrange element with an additional internal bubble function "FEM_PK_WITH_CUBIC_BUBBLE(3, K)"
Lagrange element with an additional bubble function on face 0 "FEM_P1_BUBBLE_FACE(3)"
This element is not -equivalent (The matrix is not equal to identity). On the real element linear combinations of , and are used to match the gradient on the corresponding vertex. 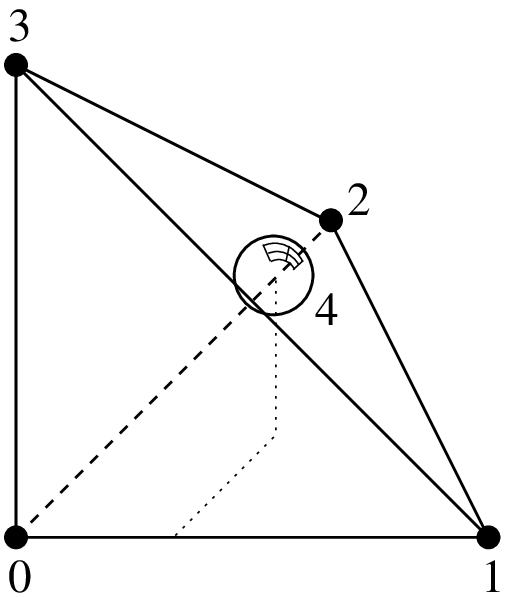 Idem on the other vertices. Hermite element on a tetrahedron "FEM_HERMITE(3)"